by Carl Davidson on Nov 02 2006. We are Chicago area residents who first came together as Chicagoans Against War in Iraq in September 2002 feeling the urgency to raise our voices and take action against the growing danger of war in Iraq. We come from all walks of life and many political perspectives, but we are united on the belief that the Bush administration is pursuing a reckless, lawless and dangerous policy that is against the best interests of our country and the world. The threat posed by the Hussein regime to the region could have been contained and thwarted by other means. In June 2003, to adapt our name to reflect the changing political atmosphere and our changing goals, we changed our name to Chicagoans Against War and Injustice. 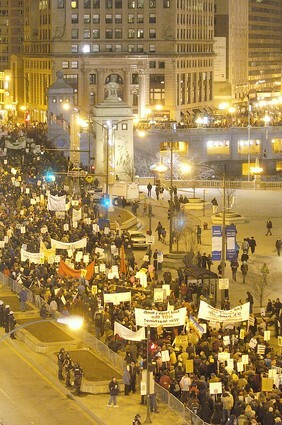 We are an affiliate of United For Peace & Justice nationally and the Illinois Coalition for Peace & Justice statewide. We participate in all mass mobilizations and broad alliances against the war, but we also working in the legislative and electoral arenas. We encorage elected officials to join are ranks, and several have done so. We helped get the Chicago City Council to vote against the war, registered over 20,000 new voters, and helped get an antiwar referendum on the ballot in Cook County in 2006. The measure gathered over 800,000 ‘Yes’ votes–winning by an 80% to 20% margin. We have a working core of about 100 people, with 2000 more on our email lists. We have a close network of neighborhood-based affiliates around the city and allies in the suburbs and surrounding counties who send representatives to our monthly meetings. This is a good start, but we need much more. Join us and support us on whatver level you can! Do you have any buttons from your group to promote your organization or events? I collect buttons related to peace and justice from around the world. I would greatly appreciate any you can send me. Please let me know how I can order some. Please note: Comment moderation is currently enabled so there will be a delay between when you post your comment and when it shows up. Patience is a virtue; there’s no need to re-submit your comment. Theme copyright © 2002–2010 Mike Little.